Gaffney, Owen, and Félix Pharand-Deschênes. Welcome to the Anthropocene. 2012. Length: 3:38 min. Made available on the Environment & Society Portal for nonprofit educational purposes only. © 2012 by Globaia, Planet Under Pressure, SEI, SRC, CSIRO. All rights reserved. Crumbling skyscrapers, crushed soda cans, and worn-out car tires: concrete, aluminum, and plastic are the physical traces of our time. It is a time in which humans intervene in nature, and thus change and shape it. A world has developed in which humans and their needs play a dominant role in the ecological system. The human influence is so great that man-made changes are becoming visible in the geological record and there is talk that a new geological era has arrived: welcome to the Anthropocene. This thesis was first introduced 15 years ago and has been the topic of much debate since then. At first, the idea of an “Age of Humans” was only discussed among geologists, but now it has evolved into a multidisciplinary mental framework which links scientific and engineering theories and approaches to social and culture scientific concepts. Humans in the Anthropocene not only intervene in nature as geological and biological actors, they also initiate mental processes in order to reinterpret the relationship of nature and culture, of environment and society. 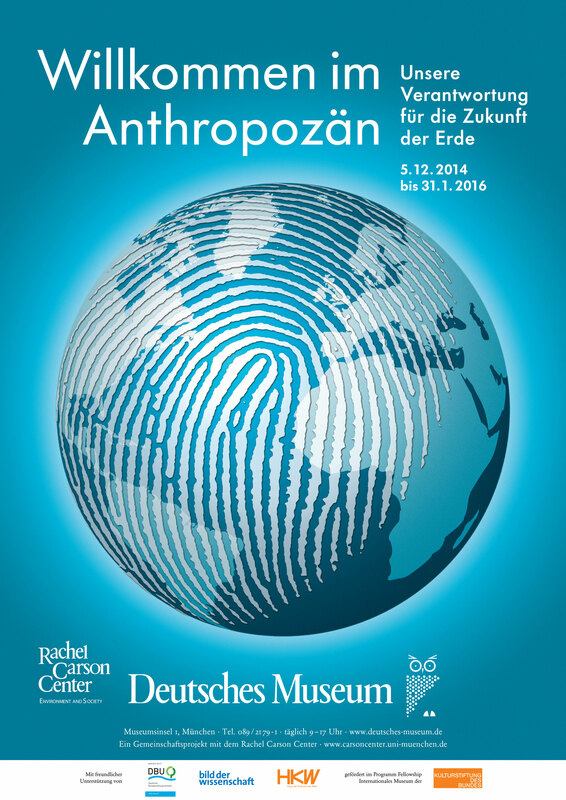 Poster for the special exhibition on the Anthropocene at the Deutsches Museum in Munich. So far, the Anthropocene is only a hypothesis and there is no consensus about its temporal scope or its scientific status. With a special exhibition on the Anthropocene, the Deutsches Museum took part in the global debate on this topic. In cooperation with the Rachel Carson Center for Environment and Society, the Deutsches Museum was the first museum to present the Anthropocene in an exhibition. 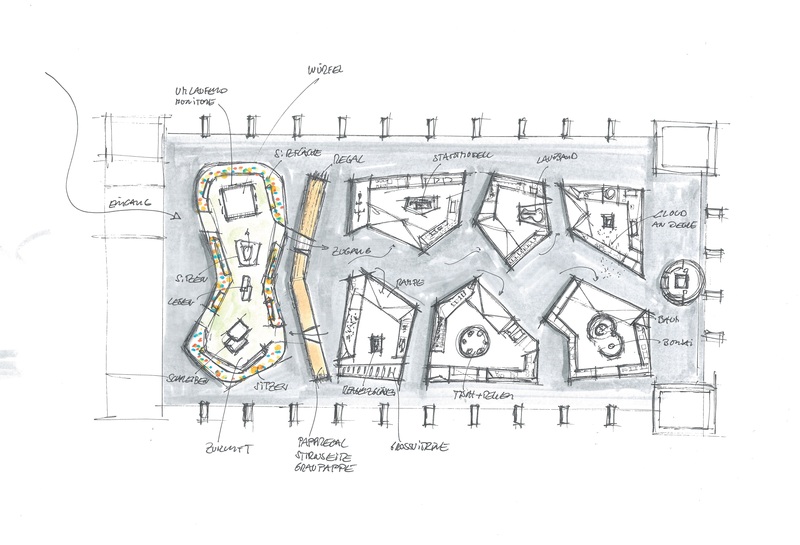 Thus we created a space for reflection, interpretation, and discussion. The exhibition room had a size of 1,450 m² and inspired visitors to ponder various questions: How could humans gain such an enormous influence on the ecological system? What is typical in the world of the Anthropocene? What will we eat? What will our cities look like? Will machines take control of our world, which is already highly automatized and regulated by algorithms? At the entrance, a supersized media-cube familiarized visitors with the Anthropocene by showing short video clips and an additional movie on this topic. The object shelf, which embraced the whole exhibition room and resembled a huge notebook or diary, presented real objects that traced the increasing influence of humans on the natural world. Six large islands addressed the following topics in detail: urbanization, mobility, humans and machines, nature, food, and evolution. They highlighted the Anthropocene’s effects and interactions on a global, biological, and social level. Carefully selected objects in combination with the central installation of film and media stations illustrated the spatial and temporal dimensions of human-caused global change and the chances and challenges we face in the Anthropocene. Designed by Klaus Hollenbeck Architekten & krafthaus Das Atelier von facts and fiction. Courtesy of the Deutsches Museum. The final part of the exhibition, which was located adjacent to the entrance area, offered visitors the opportunity to participate by sharing their visions of the future and the Anthropocene. A large bed of white paper flowers invited visitors to write down their own thoughts, fears, wishes, and hopes and thus let them add their voices to the exhibition and the Anthropocene. The Deutsches Museum, located at Museumsinsel 1 (Munich, Germany) and open every day between 9 a.m. and 5 p.m., hosted the exhibition from 5 December 2014 until 30 September 2016. For further information on the exhibition and its reception, please visit the Deutsches Museum archive. The essays and images on this website presented a small sample of the objects on display at the Deutsches Museum, Munich. This digital companion to the exhibition was prepared by the Environment & Society Portal and the Deutsches Museum. Möllers, Nina. “Welcome to the Anthropocene: The Earth in Our Hands.” Environment & Society Portal, Virtual Exhibitions 2014, no. 2. Rachel Carson Center for Environment and Society. doi.org/10.5282/rcc/6354.